Some of you might know him as Big George while others may call him George Foreman, the boxing legend has remained in the limelight for a long while despite making his way out of the game since 1997. Interestingly, the boxing veteran is the oldest heavyweight champion who made strides during his active years as a boxer. The legendary boxer clinched an Olympic gold medal as well as two heavyweight championship titles during his boxing career. Asides from being a boxer, George is equally an ordained minister as well as a business mogul. Learn more about George Foreman below. George Edward Foreman was born on the 10th day of January 1949 in Marshall City of Texas in the United States. He was raised by his stepfather J.D Foreman whom his mother married after her divorce with his biological father. While he was growing up, George experienced a rough childhood and even dropped out of high school when he was fifteen years old. He later relocated to Pleasanton, California where he eventually started training as a boxer. By the age of twenty, George had honed his boxing skills and was ready to kick off his amateur career. Representing team US, George qualified for the Olympic Games held in Mexico City in 1968. During the competition, George clinched his first gold medal after defeating Russia’s Jonas Cepulis. He also won his first amateur bout during the Parks Diamond Belt Tournament in 1967. In the same year, he won the Las Vegas Golden Gloves after beating Thomas Cook in the tournament. The following year, he won a series of championships including the San Francisco and AAU Heavyweight titles. Amazingly, the outstanding boxer finished his amateur career with a record of 22 – 4. Turning pro in 1969, George Freeman became one of the most feared figures in the ring. He brutalized all his opponents at every game and was able to maintain an undefeated record of 37 – 0 in 37 bouts. He triumphed over the then heavyweight champion Joe Frazier in 1973 to win his first heavyweight championship title. Two years later, he surrendered to Muhammad Ali in the Rumble in a Jungle bout; thus earning his first career loss. In pursuit of his second title, the boxer also lost to Jimmy Young in 1977. After his loss to Jimmy, George suffered a near-death situation in the dressing room; he had heatstroke and exhaustion. After praying to God for healing, he became a Christian and further took a temporary hiatus from boxing so he could pursue a career as an ordained minister of God. Later on, he founded a non-denominational ministry called George Foreman Youth and Community Centre situated in Houston. Ten years after he left the game of boxing, George Foreman decided to return in 1987. Upon his return, the boxer triumphed over many top opponents including Dwight Muhammad Qawi, and Steve Zouski, among others. He took a shot at the heavyweight title against Evander Holyfield but was eventually defeated by the Evander in 1991. He won the title later in 1994 after defeating his 20-years younger opponent Michael Moorer. Foreman lost the title in 1996 after he was narrowly beaten by Shannon Briggs. He finally bowed out of the game after his loss to Briggs. Throughout his career, George Foreman won 76 out of his 81 professional bouts. While George Foreman returned from his temporary retirement, the boxing champion collaborated with Spectrum brands in manufacturing a fat reducing grill called George Foreman Grill. The business partnership began in 1994 and as of 2009, it has sold over a hundred million units. The boxing champion was reportedly paid $138 million for the rights to use his name by the company. He also earns 40 percent of the profits from each grill sold. Asides from the grill, George is also associated with other top brands including InventHelp, among others. 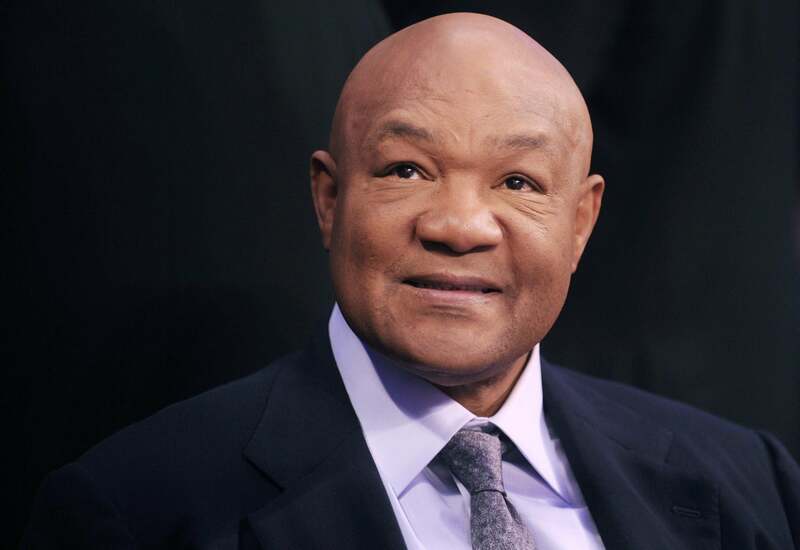 Net Worth: How Much is George Foreman Worth? The boxing legend has amassed a fortune for himself and is currently regarded as one of the richest boxers of all time. George Foreman currently has a staggering net worth of $300 million. He made his wealth from his boxing career as well as his other businesses. In addition, George owns several properties and also has the best collection of cars parked in his garage. While the boxing legend has recorded tremendous success in his career, he is also successful in his love life. He got hitched to the love of his life named Mary Joan Martelly in 1985. Meanwhile, before their marriage, George was previously married four times. His first marriage was with a lady named Adrienne Calhoun in 1971. Their marriage lasted for three years before they went their separate ways in 1974. After that, he married Cynthia Lewis in 1977 and two years later, the duo got divorced. He also got hitched to Sharon Goodson in 1981 and due to irreconcilable differences, they went their separate ways the following year. His fourth marriage was with Andrea Skeete and it lasted from 1982 to 1985. Amazingly, his marriage to Mary has been his longest-standing marriage to date. The pair has been together for over three decades. George Foreman has a total of twelve children which include seven daughters and five sons from his numerous marriages. His daughters include Natalia, Leola, Georgetta, Freeda, Michi, Isabella, and Courtney while his sons are George Jr., George III, George IV, George V, and George VI. Interestingly, he named all his sons after himself and their names have something in common. Just like Foreman, his children are also successful in their chosen careers; his son George III is currently doing well as a boxer and entrepreneur while George IV participated in the second edition of American Grit and finished seventh. His daughter Isabella has become a successful blogger and the owner of the popular Swedish blog BellaNeutella.